For decades scandals about women in the military have persisted, from Tailhook and Aberdeen to reports of sexual assaults and misconduct in the U.S. Naval Academy, the U.S. Army, and, recently, in the U.S. Air Force Academy as well. In this bold and unflinching book, Carol Burke tries to figure out why this keeps happening. 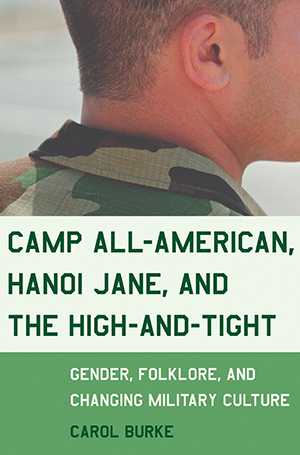 A folklorist who taught as a civilian professor at the Naval Academy in Annapolis, Maryland, for seven years, Carol Burke analyzes the military as an occupational folk group. Observing that both the official and unofficial convey significant information about military culture, she examines every detail of the military: from the “high-and-tight” haircut and chants sung in basic training to the pranks and jokes, the drinking games, and the hazing of new soldiers. Burke explores the minute ways that “the cult of masculinity” persists in all branches of the United States military today, and she unearths fascinating details and offers eye-opening anecdotes about basic training, military dress and speech, the history of the marching chant, the disdain some veterans still harbor for Jane Fonda, and the colorful-and sometimes questionable-rituals of military manhood. She argues that acts of harassment keep recurring because historically the military has been “what made a man of you“-in other words, an exclusionary all-male institution. But, Burke contends, military culture is made-not born-and now it’s time that the military consciously changed its policy of “gendered apartheid” so it can evolve into the gender-, race-, and sexuality-neutral democratic institution it deserves to be. "A wake-up call by a woman on a mission." "After reading Carol Burke, the U.S. Naval Academy and its counterparts throughout the military will never look-or sound-the same." "Razor-sharp in its analysis, and harrowingly well informed, Burke's important book is essential for those concerned with our military, democracy, and culture." "Burke's work is an eminently readable, eye-opening, yet thoroughly grounded scholarly tour-de-force . . . [Its] importance . . . and its contribution to the study of women and war cannot be overemphasized." "Carol Burke wasn't at all surprised to learn that soldiers ritualistically tortured Iraqi prisoners and documented their deeds. Her research, done long before the Abu Ghraib news broke, shows that these types of practices are widespread in military cultures around the globe."